I have hiked to Hemphill Bald from the east along the Cataloochee Divide many times. However, this was the first time approaching from the west on the Hemphill Bald Trail from Polls Gap. This made my second foray into the Heintooga region of the Smokies in recent weeks, another beautiful piece of the national park that doesn’t get enough attention. This trail would show up in any hiking glossary as the pure definition of roller coaster. While only changing little more than 500 feet in elevation, because of all the up and down you will gain close to 3,000… a really good workout. As always, the reward at Hemphill Bald is well worth your efforts as you will find one of the best views of the Blue Ridge Mountains from anywhere in the Smokies. My friend Ken and I tackled this adventure on Wednesday, June 15, 2016 beginning at 8:15AM and ending about 2:10PM. Our plan was to take the Hemphill Bald Trail from Polls Gap to Hemphill Bald, then return. Blaze: None needed Hike Rating: Difficult. Strenuous climbing involved. Hike Configuration: Out and back, up and down roller coaster. Trail Condition: Very good until you get to Pine Tree Gap. Then it is overgrown with tall grasses. Otherwise, there are some rocky and rooty areas, but mostly comfortable. Starting Point: Parking area at Polls Gap on Heintooga Ridge Road. Trail Traffic: There were no other hikers, but we saw horseback riders and cows. How to Get There: Take the Blue Ridge Parkway to milepost 458 and turn onto Heintooga Ridge Road, also known as Balsam Mountain Road. Travel 7 miles to Polls Gap. Parking is on the right. There is enough parking room for about 3-4 vehicles. There was a 50/50 chance of rain and thunderstorms in the afternoon on this day — and we didn’t want to be on top of a 5,500′ bald mountaintop with lightning flying all around — so we got an early start, arriving at Polls Gap at 8:00. The last few miles along the Blue Ridge Parkway and Heintooga Ridge Road we were treated to a few elk, including a new born, and dozens of wild turkeys. We passed the trailhead for Flat Creek, a hike enjoyed just two weeks prior, and continued an additional two miles to Polls Gap. There are three trailheads at Polls Gap (sometimes known as Paul’s Gap), including Rough Fork. If you are really ambitious you can make a 14 mile loop out of the trail I’m about to tell you about, and a connection to Rough Fork. We didn’t have quite that much energy. 9.5 miles of the Hemphill Bald Trail would be enough for us on this day. Surprisingly, despite all the trailheads, the parking at Polls Gap is quite limited. There are only three marked spaces. You could maybe fit one more, but it pays to get there early. The Hemphill Bald Trailhead is on the east end of the parking, and starts out as a nice, level stroll on a two track old logging railroad bed. Because of overnight rain, and the expectation of more, there was a murky fog hanging over the very green forest of yellow birch. Much like the Flat Creek Trail, this area of Heintooga was heavily logged just before the national park came into existence, so there is a lot of wispy grass lining the trail. When the mountainsides were clear cut, the first thing to take hold afterward was grass, and it remains today. Soon the trail enters an area known as Sugartree Licks as the forest changes to mostly sugar maple. The Caldwell Fork drainage is evident through the trees on your left, and occasionally you will get a brief glimpse through the trees of the mountains that surround Cataloochee Valley. Beginning about three quarters mile from the trailhead, this area of the forest is absolutely loaded with may apple. Visit here sometime in mid-to-late-May for an opportunity to enjoy the delightful blossoms and fruit produced by this quirky wildflower. 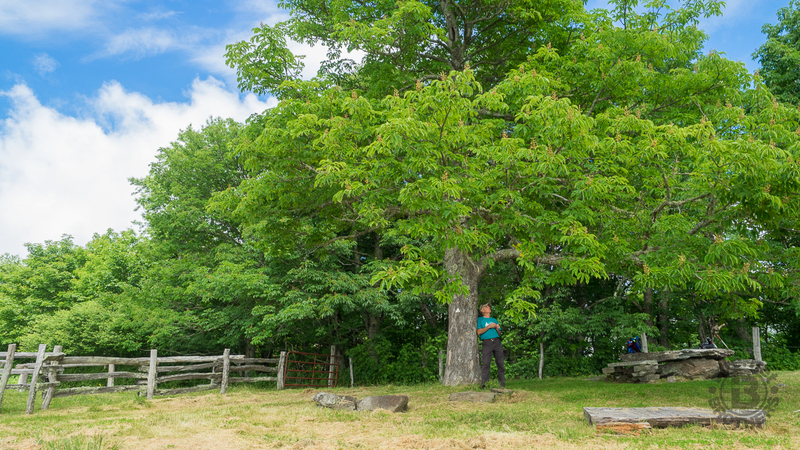 There are also stumps and logs of long-gone chestnut trees, the former gentle giant of the eastern American woods. You will now hop on the roller coaster ride, climbing to Whim Knob, then descending to the eastern park boundary marked by the always-present rustic locust fence line. Once again you climb, this time to Buck Knob among a rich forest of buckeye, maple and birch. 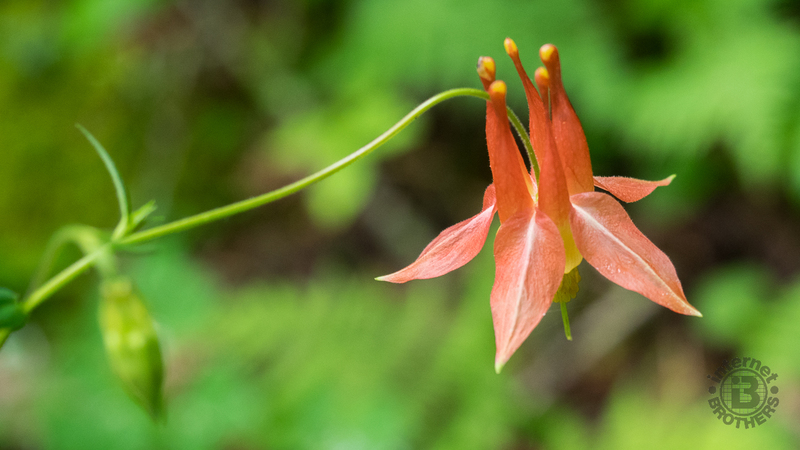 We also found a series of late Spring wildflowers in abundance including lots and lots of tassle rue, and my first sighting of the orangish-red North Carolina columbine. The spurred flowers of the native columbine point upward, with 5 red petals. The underside has numerous yellow stamens. This is likely to be a wonderful wildflower trail in late April through May as we saw evidence of both smooth and false solomon seal and plenty of wild geranium. I clicked a reminder in my brain to come back for another visit earlier in a future year. As you reach 3 miles, the trail descends once again through a muddy, moist area… evidence of an active spring, passing through Maggot Spring Gap before climbing (yes, again) to Little Bald Knob. You enter heath country here, with lots of rhododendron and mountain laurel. We didn’t see any rhodies blooming, but much of the laurel was displaying its pinkish-white finery. There was also one lone flame azalea tree in bloom. Near the four-mile mark, the boundary fence line changes from locust to a more modern barbed wire as you reach the Cataloochee Ranch. The ranch shares the property line with the national park, and a generous story. Cataloochee Ranch was founded by “Mr. Tom” and “Miss Judy” Alexander in 1933 and was originally located in the serene and beautiful Cataloochee Valley. In 1938 Mr. Tom purchased a large part of the present Ranch property on Fie Top Mountain. It is an active cattle ranch (as evidenced by the dozens of cows Ken and I were about to pass), but it is also a guest ranch offering mountain cabins, horseback riding, and beautiful Smokies ambiance. The best part is the Alexander family has placed more than 200 acres of Cataloochee Ranch in a conservation easement, to join the national park in the future. It’s now time to begin the final 400 foot climb up Hemphill Bald. Forest on your left in the national park, and open ranch on the right. Tall grass lining the trail on your side of the fence, and a variety of cows on the other. Look for large thickets of mountain laurel on the ranch property, and seasonal wildflowers on the trail including bergamot, turks cap lily, buttercup and snakeroot. This environment where forest meets open field is what is known as a margin and is very popular with songbirds. As you climb higher and higher, the vista opens up more and more. At first you can just see the top of the Cataloochee Ski Mountain, then the slopes come into view. You notice the famous mountain landmarks that stand high above Maggie Valley like Lyn Lowry, Waterrock Knob and the Plott Balsams. Test your smelling ability by sniffing for various varieties of wild mint, but be prepared for the occasional aroma of a cow pie. One of the Cataloochee Ranch horseback processions passed us by, with smiles all around. At first some of the cows were skittish, but once they realized that we were harmless, they went on about their business. At 4.7 miles you reach the grass lined summit of Hemphill Bald. When I had been here just a month before (from the Cataloochee Divide), this acre at the summit had been filled with a remarkable fringed phacelia garden. We shed our packs, checked beneath the stone picnic table for rattlesnakes, and sat down to enjoy lunch and the majestic view of the far-distant Blue Ridge. From here you can see Mt. Pisgah and Cold Mountain, Purchase Knob and the Black Mountain Range among many others. It takes my breath away every time. There is a dignified old buckeye tree on the summit that provides perfect shade for weary hikers. Ken ponders life in the mountains as he stands beneath this stately buckeye. The sky was changing every five minutes. First threatening gray, then azure behind puffy white clouds. When the breeze began to freshen we decided it was probably best to get off the mountain as we didn’t want to see the bad side of those 50/50 odds. We waved goodbye to the scenery, the wildflowers… and the cows. That 400 feet was a whole lot easier going down than it was going up. Before I knew it we were back down at Pine Tree Gap and re-entering the forest. There was one more nice surprise for us. Ken was the first to see it, about 10 feet off the trail. There was a trio of purple fringed orchids, another first for me. Added to the tassle rue and native columbine, this had been a nice day for me with new wildflower sightings. I can’t quite explain it, but this has become a new fascination for me in my old(er) age. What isn’t a fascination is sweaty, fatiguing hill climbs. The roller coaster back was hard. After about a combined 7-8 miles I really began to feel it. Short breathers became more and more frequent. Those chestnut stumps along the trail made great seats while I waited for my lungs to catch up with the rest of me. I remembered from the morning that the first half mile was on double track trail, so I anxiously awaited seeing it again. It would mean we were nearly done, and the final push would be flat. And so it was. Believe me I was tired when we finished, but also pleasantly refreshed. It had been a good day, and we beat the expected storms. This hike was definitely a good workout. Summarizing, one thing to keep in mind about Heintooga is that it is only open June through October. I can see the road and campground being closed in winter months because of snow in the high country, but I’m not quite sure why it isn’t available in April, May and November. So if you want to see the May wildflowers you have to come from Cataloochee Divide, or up Rough Fork. Otherwise, I thoroughly enjoyed this hike. It is a good physical challenge. The forest is quite engaging, and the wildflowers were a somewhat rare assortment. And of course, the view from the summit of Hemphill Bald is hard to beat.